Win a Copy of Disney’s Dumbo 70th Anniversary DVD/Blue-Ray! You are at:Home»Columnists»Win a Copy of Disney’s Dumbo 70th Anniversary DVD/Blue-Ray! One of my earliest memories is of riding the Flying Dumbo ride at Disneyland. I had just seen the movie (long, long ago and in a galaxy far away, when one had to wait for it in theaters) and was thrilled to feel like Timothy the mouse as I soared on Dumbo’s back. On September 20th, Disney will release the 70th Anniversary high-definition edition of Dumbo on DVD and Blue-ray. The latest technology has been utilized to ensure that the color and audio captures Walt Disney’s original 1941 release print from the Disney vault. Interestingly, Dumbo, based on a short story by Helen Aberson, was supposed to be a short film. Yet after the financial failure of Disney’s Fantasia and Pinocchio, the studio decided to release it as a feature film in an effort to recoup losses. The director was instructed to keep the film simple and inexpensive. As a result, the backgrounds were sparse in detail and painted in watercolor, allowing the director to focus on character development. Audiences loved the charming story, and brisk ticket sales quickly filled the Disney coffers. 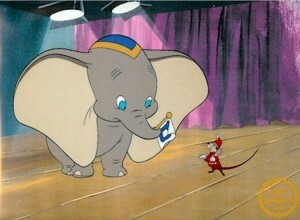 In fact, Dumbo was the highest-grossing Disney film of the 1940’s. Part of Dumbo’s appeal is the infectious score, which earned the film an Academy Award® for Best Music. I will always be partial to the haunting lullaby “Baby Mine,” but toe-tapping favorites “When I See an Elephant Fly” and “Pink Elephants on Parade” are enjoyed by audiences of all ages. This latest release has gorgeous color, a crisp digital picture and theater-quality sound. The DVD is packed with extras, including deleted scenes, a “how it was made” feature, and my favorite, a child’s eye view of the Disneyland Flying Dumbo ride. The Blue-Ray edition offers even more bonus content, including games and animated short films. Catholic Lane readers will have an opportunity to win a free copy of the 70th Anniversary Dumbo DVD/Blue Ray combo pack. Simply leave a comment on this article, and you will be entered into the contest. Remember that you must first log in or register as a new user in order to leave a comment. Deadline for entering the contest is Friday, September 23rd at 11:59 pm Pacific time. The winner will be notified through his or her registered email address. Next Article Do We Question a Generous God? I would love to win the Dumbo DVD and gift it to my daughter who has a huge collection of Disney DVDs! I would love to win a copy to give to my 3 year old son! Thank you for hosting this contest! Congratulations to mjanicewp, the contest winner. Thank you to everyone who took the time to enter. Hi Janice! I have been trying to contact you through email to get your address as you won the contest, but I have not received a response. Please reply ASAP or I will have to send the DVD to someone else. If I haven’t heard from you by October 10th, then I will have to choose another winner. Sorry to do this, but the promotion company is waiting to get an address. Please email me at peggybowes@gmail.con and give me your mailing address. Thanks! This is a great movie. I would love it for my kids! First of all, let me commend you for the Rosary Workout!! It has been life-changing for me and my husband. Kevin Vost recommended it to me in person!! Secondly, winning a copy of Dumbo would be delightful!! My fried, Ada, recently gave me Beauty and the Beast for my grandchildren…it is presently in the “vault” and not obtainable by the general public…What a joy good movies present to our little ones!! God Bless you and yours always!! Thanks so much for the nice comment, Nanny! I still have not yet met Kevin in person, but consider him a dear friend. God bless you and your family. I take issue with the entire concept. In my opinion, Christians should do all they personally can to avoid anything having to do with DISNEY. They are purveyors of blatant sexuality; ANTIi-CHRISTIAN; amoral. For Christian parents to buy videos however cute, adorable and “i watched it as a child”, is wrong. There are plenty of Chritian children’s videos available. I would love to win! I <3 DUMBO! This is a great movie. I agree.